Many wellness programs use incentives like these to motivate and encourage people to make healthier lifestyle choices to accomplish bigger goals such as improving population health and controlling healthcare costs. 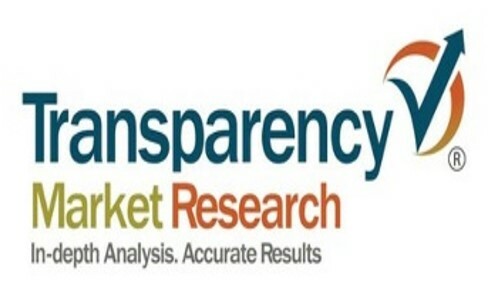 It's what's driving an upward trend in the wellness industry, according to a recent report published by Transparency Market Research. The wellness industry is expected to grow by about 9 percent per year and double current annual revenue by 2026 to an estimated $62 million a year in the U.S. alone. The report also found that most wellness programs have at least one thing in common: a health risk assessment. It's a critical tool organizations can use to measure population health, and develop interventions to prevent and control chronic disease. "The health risk assessment segment accounted for a major market share in 2017, and is likely to dominate the global corporate wellness market through 2026," according to the report. Many argue that data collection is the most important piece of your wellness program. If you’re in the business of population health management, design wellness programs, or provide commercial or individual health plans, choosing the right HRA can get a little bit complicated. Do a little homework, and you quickly learn about HRA software, features, reporting tools, the user interface experience, tech requirements, and much more. Now what? It’s the “get information” and “compare options” stages of the process that often bog down the decision-making process. But it doesn’t have to be that way. Think of it like going grocery shopping. Show up hungry without a list, and everything looks good. Even stuff you don’t need. And it takes a lot longer to get to the checkout line. But if you’re prepared with a shopping list of food you need for meals, it’s a lot easier to get what you need, stick to your budget, and eat healthier. When you’re at the grocery store looking for the items on your shopping list, there’s usually more than one option. For example, plain whole-grain bread, or whole-grain bread with nuts and seeds. Or a whole stalk of broccoli you’ll have to wash and chop, vs. frozen or pre-cut broccoli florets. How do you decide? You look at the options to find out which best fit your wants, needs, and budget. It’s a process that’s a lot like finding the right HRA for your organization. But a little more detailed than trying to choose bread or broccoli. Must-have vendor requirements. Narrow your options by identifying HRA vendors with specific industry experience, certifications, and support. Content and design. Evaluate the user experience, design, and content based on your population needs. Security. Verify the HRA meets all state and federal security requirements to protect personal health information. Integration. Find out if the HRA is compatible with your platform, website, portal, and any existing data, and what to expect during the integration process. Customization and reporting. Get details on customization features and reporting tools for participants and administrators. Performance. Compare HRA completion time, and infrastructure to handle traffic. These are key factors that can help you find the right HRA for your population to promote health, prevent disease, control healthcare costs, and improve productivity. 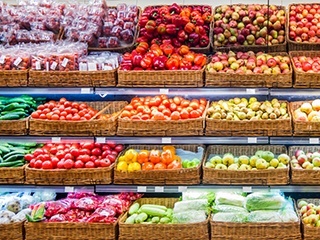 Choosing the right health risk assessment is a big decision for any organization and usually takes a little longer than a trip to the grocery store. That’s because there’s a lot of variables you should consider to make the right choice that meets your wants and needs, fits your budget, and will have the greatest impact on population health. Need help comparing HRAs? 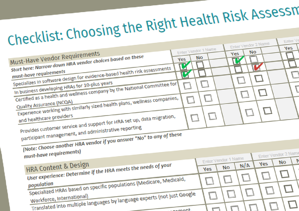 Use this HRA Checklist to compare vendors, evaluate your options, and make an informed decision. "The health risk assessment segment accounted for a major market share in 2017, and is likely to dominate the global corporate wellness market through 2026."